A new report from researchers at Queen’s University has found that there are significant attitudinal differences and direct experiences towards the PSNI and their use of stop and search powers from 16 year-olds across social and religious lines. Dr John Topping (Lecturer in Criminology) and Dr Dirk Schubotz (Lecturer in Social Policy), from the School of Social Sciences, Education and Social Work at Queen’s co-authored the report entitled The ‘usual suspects’? Young people’s experiences of police stop and search powers in Northern Ireland which was launched today (Wednesday, 23 May) as part of ARK’s 2017 Young Life and Times (YLT) and Kids’ Life and Times (KLT) surveys at Queen’s University. Speaking about the findings, Dr Topping said: “From our research encompassing a representative sample of 16 year-olds from across Northern Ireland, we found that those from urban and more deprived areas had significantly lower perceptions and experiences of fairness in treatment by the PSNI, particularly concentrated in more disadvantaged Catholic and self-defined Republican areas. “The data clearly demonstrates that 16 year-olds who defined themselves as Catholic and Republican were significantly more likely to perceive PSNI stop and search as a form of unnecessary harassment than their Protestants counterparts and think of the PSNI more negatively when they were stopped and searched. 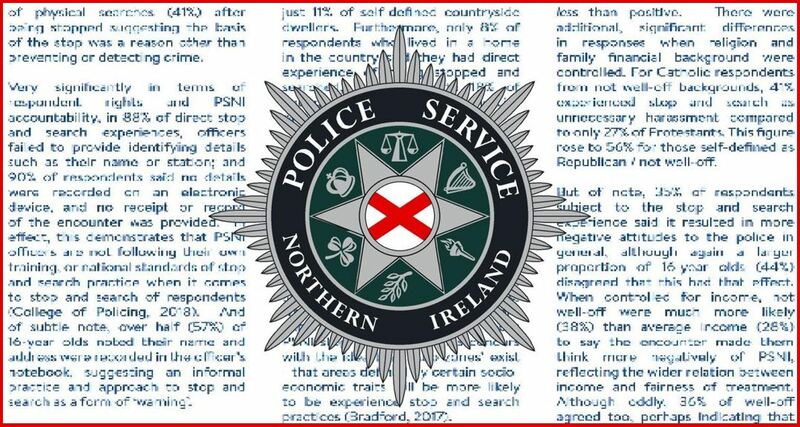 “This is in no way suggesting that the powers are being used differentially by the PSNI, not least because religious data is not formally collected as part of the stop and search process. However, the fact remains young people are experiencing use of the power differentially. For the first time in the PSNI’s history the report provides a comprehensive dataset of young persons and children’s views on use of what may be defined as ‘everyday’ stop and search powers, predominantly under the Police and Criminal Evidence (Northern Ireland) Order 1989 (PACE) and Misuse of Drugs Act 1971 (MDA). “The overall use of these everyday stop and search powers by the PSNI has increased over the past decade. “Between 2010/11-2017/18, stop and search powers have been used approximately 30,000 times against children – under 18s in Northern Ireland. The research found that the PSNI are using these everyday powers at a higher level and with lower arrest levels compared to England, Wales and Scotland,” added Dr Topping. Dr Schubotz commented: “This pioneering new publication fits neatly with the previous work that ARK’s KLT and YLT surveys, and Queen’s University’s interdisciplinary Centre for Children’s Rights, have undertaken for many years to highlight shortcomings in policy and practice when it comes to children’s and young people’s rights. “The PSNI’s use of stop and search is subject to the guidelines for use of the powers in the Department of Justice’ Code of Practice A, which also incorporates the UN Convention on the Rights of the Child. The Young Life and Times (YLT) survey records the attitudes of 16 year-olds only, while the Kids' Life and Times (KLT) survey records the attitudes of all primary 7 schoolchildren in Northern Ireland. ARK (which stands for Access Research Knowledge) is a joint resource between Queen’s and Ulster University, which was established in 2000. ARK aims to make social science information on Northern Ireland available to the widest possible audience. ‘The usual suspects’? Young people’s experiences of police stop and search powers in Northern Ireland’ research report is available here. For information on all YLT and KLT survey results, please visit: www.ark.ac.uk/ylt/ and www.ark.ac.uk/klt. Media inquiries to Zara McBrearty at Queen's Communications Office, telephone: +44 (0)28 9097 3259.